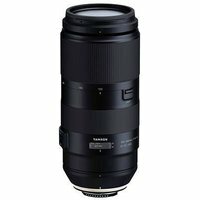 The Tamron 100-400 F4.5-6.3 Di VC USD Lens is an ultra-telephoto zoom that offers superior image quality in a lightweight, compact design. Designed for full-frame Canon DSLRs, the lens delivers precise and fast AF performance thanks to its USD (Ultra-sonic Silent Drive) and Dual MPU (Micro-Processing Unit) control system. Its versatile focal length is perfect for sports, wildlife and portraits.